Classic Grills offers a variety of registers/grilles that you can choose for your needs. 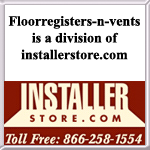 They have an array of decorative floor, wall, and ceiling vents from round to rectangle. They are special ordered and non-returnable and have a lead time of 7-9 weeks. Get your solid bronze vent covers today and have them finished in a light, antique or dark hand rubbed patina. The Renaissance return air grilles are made by hand and can be used in wall or floor installation. This item is considered Special Order, Non-Returnable and cannot be canceled once placed. Lead time is 7 to 9 weeks. Our solid aluminum wall vents are made by a sand cast and can only be used in the wall or ceiling. Order this decorative air grille in the Renaissance design today! This item is considered Special Order, Non-Returnable and cannot be canceled once placed. Lead time is 7 to 9 weeks. Solid white bronze metal air grilles will help keep air flowing in your home whether it be for heating or cooling needs. Get your Renaissance decorative air return vent and use it in your floor, ceiling or wall. This item is considered Special Order, Non-Returnable and cannot be canceled once placed. Lead time is 7 to 9 weeks. These Octagon decorative vent covers are made in a sand mold and by hand. Order your solid bronze air return grille and install it into you wall, ceiling or floor! This item is considered Special Order, Non-Returnable and cannot be canceled once placed. Lead time is 7 to 9 weeks. Order your aluminum vents by Classic Grilles today and use them is rooms with higher levels of moisture since they will not rust. These decorative wall grilles do come with a black screen backing to help hide ugly ductwork. This item is considered Special Order, Non-Returnable and cannot be canceled once placed. Lead time is 7 to 9 weeks. This white bronze Octagon decorative grille has a clear coating finish to protect the faceplate. Made from a sand cast, this cold air return vent cover will install with the screws provided onto your wall or ceiling. Damper is not included. This item is considered Special Order, Non-Returnable and cannot be canceled once placed. Lead time is 7 to 9 weeks. Choose your solid bronze vent cover to come in either light, dark or antique hand rubbed patinas. Each grille is hand made for a unique look. Our bungalow style covers allow air to move freely in your home. This item is considered Special Order, Non-Returnable and cannot be canceled once placed. Lead time is 7 to 9 weeks. Order this aluminum grate with pre drilled screw holes and a screen backing to help hide your ductwork. Screws come with the purchase to make installation easier. Intended for the wall or ceiling, the Craftsman style covers display a square by square pattern. This item is considered Special Order, Non-Returnable and cannot be canceled once placed. Lead time is 7 to 9 weeks. These Craftsman bungalow style covers are sturdy enough to use in your floor since they are made from solid white bronze. They are sand cast here in America and have a 1/4" thick faceplate. Finish is similar to a brushed nickel look. This item is considered Special Order, Non-Returnable and cannot be canceled once placed. Lead time is 7 to 9 weeks. This solid bronze Art Deco vent cover by Classic Grills is hand crafted and hand rubbed in your choice of patina. Our decorative air grille is made with care in the US and can be used on your wall, ceiling of floor. This item is considered Special Order, Non-Returnable and cannot be canceled once placed. Lead time is 7 to 9 weeks. Our solid aluminum air vent covers are made 1/4 inch thick and come with screen backing. Let air flow freely into your home with this Art Deco style grille which will bring a modern look to any space. This item is considered Special Order, Non-Returnable and cannot be canceled once placed. Lead time is 7 to 9 weeks. Unique white bronze Art Deco vents by Classic grilles are finished in a clear coating for added protection. These metal air grilles are made with a screened back and will continuously allow air to flow into your room. This item is considered Special Order, Non-Returnable and cannot be canceled once placed. Lead time is 7 to 9 weeks. Solid bronze Victorian grilles are sand cast and feature your choice of a hand rubbed patina finish in light, dark or antique. Use these metal air vent covers in your floor, ceiling or wall and order with or without screw holes. This item is considered Special Order, Non-Returnable and cannot be canceled once placed. Lead time is 7 to 9 weeks. Use these aluminum vent covers on your wall or ceiling by simply screw mounting them into place. These Victorian air vents come in your choice of painted brown, black or white finishes. Leave bare for a chrome look! This item is considered Special Order, Non-Returnable and cannot be canceled once placed. Lead time is 7 to 9 weeks. Made to order, this Victorian vent is hand crafted from a unique sand mold right here in the US. Solid white bronze decorative air return covers are hard to find, so order this durable product today and ship straight to your door. This item is considered Special Order, Non-Returnable and cannot be canceled once placed. Lead time is 7 to 9 weeks. These bronze metal air vent covers are in a Grape Leaf pattern which may vary in look when ordering larger sizes. The decorative grille comes in three hand rubbed patinas and has a 1/4 inch thick faceplate. This item is considered Special Order, Non-Returnable and cannot be canceled once placed. Lead time is 7 to 9 weeks. Our aluminum vents are offered in 3 painted finishes or can be left bare for a sparkling chrome look. The decorative wall vent covers come with a screen backing which will hide duct work openings while allowing air to freely diffuse into the room. This item is considered Special Order, Non-Returnable and cannot be canceled once placed. Lead time is 7 to 9 weeks. This sand cast wall vent cover is made out of solid white bronze with a 1/4 inch thick faceplate. Screws come included with purchase for installation. Also screen backing is provided to hide duct work opening from sight. This item is considered Special Order, Non-Returnable and cannot be canceled once placed. Lead time is 7 to 9 weeks. Available in light, dark or antique bronze, this register is handmade right here in the United States. Choose this louvered wall vent to replace outdated and boring registers in your home. This Renaissance vent can be used in your ceiling, wall or floor. This item is considered Special Order, Non-Returnable and cannot be canceld once placed. Lead time is 7 to 9 weeks. The aluminum louvered vent has a faceplate that is sand cast 1/4 inch thick and can be used in bathrooms and kitchens without fear of rusting. There is a metal diffuser which is attached to the back of the vent which is adjustable. Order your vent today in either a painted finish or leave bare for a chrome look. This item is considered Special Order, Non-Returnable and cannot be canceled once placed. Lead time is 7 to 9 weeks. Renaissance decorative register covers are sand cast from solid white bronze. This metal louvered vent will have a similar appearance to chrome and will help control airflow in your home. Purchase today! This item is considered Special Order, Non-Returnable and cannot be canceled once placed. Lead time is 7 to 9 weeks. Dark, antique or light oil rubbed bronze register covers are handmade and finished by Classic Grilles. Order your decorative wall vents today and have them all ship to your door for one low cost. This item is considered Special Order, Non-Returnable and cannot be canceled once placed. Lead time is 7 to 9 weeks. Classic Grills Arts and Crafts style registers are made from sand cast aluminum. Sand casting of aluminum creates more of a distressed surface, for a more handmade look and feel. This item is considered Special Order, Non-Returnable and cannot be canceled once placed. Lead time is 7 to 9 weeks. Sand cast Arts and Crafts style register are truly a one of a kind air regulator. This wall vent cover comes in a solid white bronze and will look great on your walls, ceiling or floor! This item is considered Special Order, Non-Returnable and cannot be canceled once placed. Lead time is 7 to 9 weeks. This Octagon style metal heat register is sand cast from 100% aluminum. Order your wall air vents in either a painted finish or leave bare for a chrome look! This item is considered Special Order, Non-Returnable and cannot be canceled once placed. Lead time is 7 to 9 weeks. Sand cast solid aluminum registers by Classic Grilles are made in the USA. This Octagon wall air vent has a 1/4" thick faceplate with a metal damper attached at the back. Purchase now and restyle your home. This item is considered Special Order, Non-Returnable and cannot be canceled once placed. Lead time is 7 to 9 weeks. Classic Grills Octagon decorative air vents are sand cast from solid white bronze. This sidewall register can be used in the floor as well as a drop in register and has a 1/4" thick faceplate. This item is considered Special Order, Non-Returnable and cannot be canceled once placed. Lead time is 7 to 9 weeks. This made to order bronze vent cover features a square Craftsman style pattern faceplate. The register is made 1/4 inch thick and is hand crafted here in the US. Use this vent cover in your ceiling, floor or wall. This item is considered Special Order, Non-Returnable and cannot be canceled once placed. Lead time is 7 to 9 weeks. Order your Classic Grills Craftsman style vents in either a brown, white or black painted finish. The bare aluminum will be coated with a clear lacquer to protect the faceplate from oxidizing. Install with screws onto your wall or in the ceiling. This item is considered Special Order, Non-Returnable and cannot be canceled once placed. Lead time is 7 to 9 weeks. Order your Craftsman metal register covers today and get this white bronze vent shipped straight to your door. These decorative wall vents come with a steel diffuser which will regulate your hot and cold air. This item is considered Special Order, Non-Returnable and cannot be canceled once placed. Lead time is 7 to 9 weeks. Sand cast for a unique look, these Art Deco style registers are made by hand. The faceplate is 1/4 inch thick and has a steel damper attached to the back. Install these aluminum vents in your wall or ceiling! This item is considered Special Order, Non-Returnable and cannot be canceled once placed. The lead time is 7-9 weeks. Available in three hand-rubbed finishes, this bronze air vent is crafted here in America with a sand cast. Durable enough for your floors, this decorative register cover can be made with or without screw holes. This item is considered Special Order, Non-Returnable and cannot be canceled once placed. Lead time is 7-9 weeks. This wall heat register is made with a steel damper and white bronze faceplate. Our Art Deco air vents are sand cast by hand and are 1/4 inches thick. Order today and use in your ceiling, wall or floor. This item is considered Special Order, Non-Returnable and cannot be canceled once placed. Lead time is 7 to 9 weeks. Purchase this aluminum wall vent and install in rooms with high levels of moisture or humidity without fear of rusting. Designed in the Victorian style, this register cover is easily installed onto the wall or ceiling with screws. This item is considered Special Order, Non-Returnable and cannot be canceled once placed. Lead time is 7 to 9 weeks. Solid sand cast bronze registers are made with a 1/4 inch thick faceplate for added durability. Our handmade decorative Victorian vent is available in a light, dark or antique bronze and can be used on any ductwork to control airflow. This item is considered Special Order, Non-Returnable and cannot be canceled once placed. Lead time is 7 to 9 weeks. These Victorian register covers are solid white bronze and sand cast for a unique product. They can be used in the floor, ceiling or wall. Order this heating air vent according to your ductwork opening to ensure the steel damper will fit into the hole. This item is considered Special Order, Non-Returnable and cannot be canceled once placed. Lead time is 7 to 9 weeks. This aluminum air vent is offered in different finishes and comes with installation screws for mounting. The decorative wall registers are sand cast and made right in the USA to ensure a quality and dependable product. This item is considered Special Order, Non-Returnable and cannot be canceled once placed. Lead time is 7 to 9 weeks. Distressed and sand cast, this bronze decorative vent cover is a one of a kind air diffuser. This American made wall air register has a 1/4" thick faceplate and the damper is constructed out of steel. Order this today. This item is considered Special Order, Non-Returnable and cannot be canceled once placed. Lead time is 7 to 9 weeks. Ceiling and sidewall vent covers don't have to be plain and white! Order this decorative Grape Leaf heat register with us and notice the difference it will make in your home. The white bronze finish is similar to chrome. This item is considered Special Order, Non-Returnable and cannot be canceled once placed. Lead time is 7 to 9 weeks.